William was Gordon's Grandfather, the Father of Elmer Austin Gillihan. As far as we know he and Elmer's Mother, Myrtle Hall were never married and I'm not sure that Elmer ever really knew his Father. William's first wife was Etta Goodman and they were the parents of Pauline and Paul, twins. Paul died at birth or shortly after. We didn't know Pauline existed until recently when her Daughter contacted me after reading one of my queries. She was kind enough to send me these photos and updated my information. William was married several more times but had no other children........that we know of. Pauline Gillihan was born July 21, 1922-23, the Daughter of William and Etta Goodman Gillihan. Pauline was a twin, her brother Paul died at birth or soon after. She died in 1971 as a result of Diabetes and kidney failure. 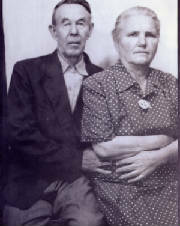 On December 27, 1937 she married Leo Simpson and they were the parents of three children. Pauline is the 1/2 Sister that Elmer never knew he had. Elmer Columbus was the Son of John Harvey and Nancy Downs Jones. 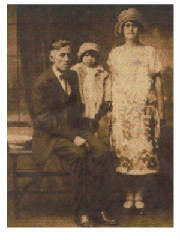 Elmer and his first Wife, Olive Stanton were the parents of William Andrew Gillihan. Olive was born in 1881 and died before 1910 when Elmer married Gennetta Corstson. I've been unable to find any history about Olive so she is one of my primary "brick walls" in this family. They were married March 8, 1896 and had five children other than William. Elmer and Gennetta had eight children of their own.